REFLEXOLOGY is a ancient form of healing carried out through the stimulation of hundreds of pressure points and nerve endings on the feet and hands. During a session the continuous stimulation of these points sends messages to the CNS (Central Nervous System) to decompress, which brings the body as a whole to homeostasis/balance, which helps the body move towards wellness. At some point in the treatment most clients fall asleep, but by the time the session is nearing completion, they feel refreshed and simultaneously relaxed. 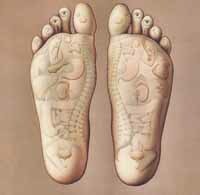 Reflexology’s objective is the activation of our own natural healing powers. Most people remark that the feeling of relaxation lasts many days: aches and pains and specific challenges begin to resolve themselves over those days. You can enjoy a one off reflexology session to give you deep relaxation or take a weekly course to work on a particular health issue or chronic challenge. After a course has been completed, it can be a great advantage to have monthly sessions as a form of preventative medicine into the future. Over my many years as a Reflexologist I have seen amazing results, ranging from eradication of panic attacks, insomnia, migraines, IBS, whiplash, tinnitus, edema, restless leg syndrome, and infertility. After my original training, I continued to gain experience over 2 years as a volunteer at a HIV/AIDS clinic in the 1990’s in London, England. This is where I became very comfortable working with serious and life threatening illnesses and the stresses and challenges my clients faced. In the late 90’s I became certified as a Birth Doula and experienced the amazing benefits of reflexology during the birth process. I have developed and refined my reflexology techniques over many years to make sure each session is pain free, but has a very powerful end result. I also offer on-site mini hand reflexology sessions at offices and other businesses. This is a great way for groups to ‘relax, refresh and refocus’. Home visits are also possible and can include extra spa services: foot bath and organic salt foot rub treatment which creates a comprehensive and luxurious session. Always know that consultations are free and confidential. What a novel experience. I felt my foot pain/neuroma release, and my lower back pain diminish. Thanks. Another wonderful experience, the energy was awesome. I could feel my body 'fall' into relaxation. From the last session I could tell a difference in my back and heel pain, amazing! I love your calm, slow, light approach. It was wonderful for calming my nervous system and taking me away from my stresses of life. Great tableside manner. I highly recommend this to others! It reduced my anxiety to the point I could approach life's stresses differently . Before your first appointment, please download this Intake Form, fill it out and bring it with you.